Located near Old Arbat Street, this street offers a contrast from the touristy pedestrian-only thoroughfare. Located near Old Arbat Street, this street offers a contrast from the touristy pedestrian-only thoroughfare. 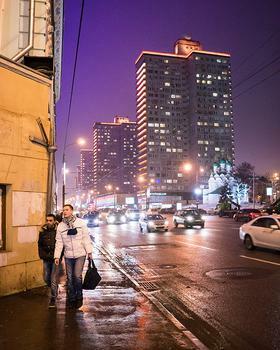 New Arbat is perhaps where Moscow's rich are the most visible, as some of Moscow's most expensive restaurants and nightclubs are located here. There are some reasonably priced cafes, however. The street is lavishly lit up at night and is always very lively. Also, check out Dom Knigi (House of Books) on New Arbat. It's not as impressive as the St. Petersburg store, but probably the best bet for books in Moscow.